There are two kinds of back-to-school purchasers: those who spend hours in the back-to-school aisles loving every minute, and those who spend hours in the back-to-school aisles hating every minute. I confess, I am the former. I love deliberating over pencils options and notebook colors. 🙂 I also know that those long aisles can be really daunting, especially the week before public schools start when the frantic last-minute shoppers turn neatly stocked shelves into rummage piles. With so many different items, where do you begin? If you are new to homeschooling, you may not know what your style is or exactly what techniques you will be using, and thus not know exactly what you will need. 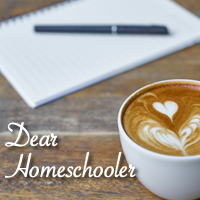 Remember, not all families homeschool the same way, and so we won’t all require the same supplies. For example, a family that uses a lot of lap books will require more glue than one that does doesn’t. Younger students tend to do a lot more crafts and so will require more art supplies than middle or high schoolers. Must-Haves: Supplies that are useful no matter what grade or technique you will be using. For The Organized: Supplies for those who like to keep everything in its place. For The Crafty Household: Supplies for those with younger children or those who plan to do a lot of art projects and crafts. For The Hands-On Learner: Supplies for those who need lesson reinforcement through other mediums than just pencil and paper and lecture. For The Curriculum-Maker: Supplies for those ambitious parents who create their own curriculum or supplemental materials from a variety of sources (or their own computer). For The Explorer: Supplies for those adventurers and scientists who learn from their environment. For The Sensory-Sensitive: Supplies for those students who need help monitoring their sensory ups and downs. For Older Ones: Supplies for middle and high school students. My kids are still in elementary, and I never taught high school students, so this list may be a little anemic. For My Family: Supplies tailored to your family’s needs. Download free School Supply List PDF here. Is there anything not on the list that you would put there? Let me know by commenting below. I hope this has been helpful.